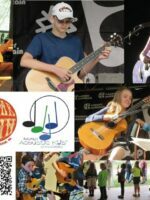 This showcase is an opportunity for young guitarists of any skill level (through age 16) to perform on the festival stage in a supportive environment. Nothing quite compares to a music festival with friends and family in the heart of the Rocky Mountains. The 4th annual Copper Mountain Music Fest features bluegrass and Americana artists from around the country. Saturday: 1:00 p.m. and 4:00 p.m.
Sunday: 12:15 p.m. and 2:30 p.m.